Making the decision to open a bar is an exciting first step. You’ve got the passion and the vision, next is the business plan. There’s a tried and tested formula for business plans, but if you’re starting a bar it’s good to take a more specialist approach. To kick things off, picture the people who will be reading your bar business plan. Most likely it will be prospective business partners, investors and lenders. These parties want proof that a company is worth their time and money, and it’s the job of your business plan to do that. In the future, it will also be read by you, as you gauge your bar’s success to date and plan your next steps. With the interests of all these people in mind, you’re ready to start writing. The executive summary outlines the key points of your business plan. It gives people a summation of the deeper content, whilst preparing and inviting them to read on. It’s succinct and highlights key points. Though mostly a summary, this section does include a mission statement to highlight your company’s values, intentions and unique selling points (USPs). It will trickle through every aspect of your business and influence who decides to do business with you. It can also help you clearly identify what you need to focus on to draw in customers, beat out the competition and stay true to the brand. Most of what you cover in the executive summary will be touched on again in the business plan. This is exactly how it should be, but you can avoid absolute repetition by building out your points and highlighting their relevance. Your vision — are you opening an easy going sports bar to cater for the local footy crowd, or a glitzy cocktail lounge to draw people in from right across the town? A description of how your bar will serve its market. A description of your target audience and how your bar will appeal to those individuals. A brief outline of your marketing plan. An assessment of your competition and how you’ll compete for market share. A financial analysis, including projections for the first few years. A guide to the owners and key staff, focusing on their skills and expertise. An implementation plan, outlining how you’ll take your bar from an idea to a living, breathing business. The company description is a fuller overview of your bar business. It details the things your reader really needs to know in a 360-degree view, including your concept, location and target market. After reading, there should be no questions left as to who, what and where you are, and why you’re doing what you’re doing. A deeper introduction the management team. Your bar’s location, including information on the relevance, opportunities and challenges of the surrounding area. A description of your bar’s offering, from food and drinks, to entertainment and venue hire. An explanation of how your products or services fulfill the market’s needs. A deeper exploration of your target market — who they are, what their habits are, how much they spend and so on. An explanation of your competitive advantage. Your objectives and goals, including any plans to expand into other business areas or markets. Start with a service industry analysis and then dive deeper into your specific segmentation to compare forecasts and trends. Design a customer persona based on experience and research, and explain why your bar will appeal to them. Analyse your competitors — how many other local bars are there and how do they stack up against yours? Write a SWOT analysis for your bar. Discuss its potential strengths and weaknesses, and the opportunities and threats it may face. What you offer on your menu can attract customers (and investors). List everything on your menu with descriptions and photos — from chips, beers and cocktails, to mixers, garnishes and other add-ons. Many purchasing decisions are based on emotion and identity, so naming drinks and writing descriptions according to your audience’s tastes is important. Take your time to consider how the language and themes you use will resonate with them. Next, focus on how you’ll source products and produce, and what impact that has on your brand identity and bottom line. After you decide what to source, lay out how you’ll manage your products and ingredients. Developing an inventory management system for your bar is necessary to optimise your daily operations and cut down spending. Finally, write up your competitive comparison to other bars in the area. This can include the drinks you offer and the ingredients you use just as much as it can mean the way you prepare and serve them. Keeping track of your competitors allows you to diversify and use your menu as a competitive advantage. The marketing strategy section in your bar business plan outlines your overall plan for finding, attracting and retaining customers. This should feature a description of your target market, as well as how you want that group to perceive your brand. Creating and running a successful bar is almost impossible without an understanding of how your pricing affects your profitability. Pour cost is a key reference point when monitoring how much you’re making back from what you’re buying in. To calculate your pour cost percentage follow this formula: (Wholesale cost of product ÷ total the product is sold for) x 100. Pour cost percentages up to 20% are considered reasonable, although this will depend on the type of bar you’re opening. The lower you can keep this per-centage, the more money you can make. Describe whether you’ll have a soft opening, a small invite-only event or a grand celebration open to the public. And be sure to expand on how you’ll execute it and generate buzz in the lead up. 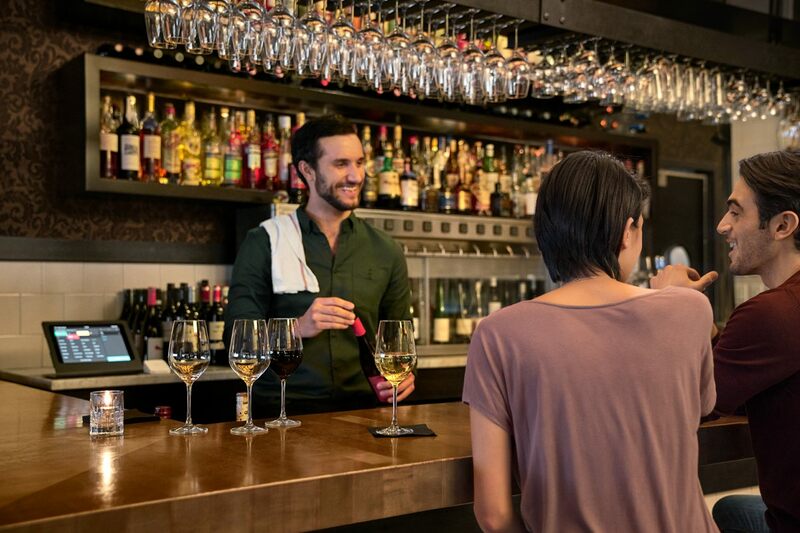 Once your bar is open, regulars will need incentives to come back and new customers will need enticing to try it out. There are many marketing channels you can use to do this — email, social media, PR, and paid ads. Events and promotions are also popular tactics used to keep business flowing in the bar industry, with many offering things like guest bartending nights, happy hours, live music and karaoke. In a survey we carried out in the U.S., 44% of people said a website was “very” or “extremely” important in their decision to try out a business. This indicates just how much an online presence (or lack of it) can impact your bottom line. Building an optimised website doesn’t have to be hard, with many tools that allow you to use simple, pre-styled themes. As an extension of your website — and especially if you decide not to build one — all bar businesses should have a social media presence. As well as helping people find out the basics, like your opening times and location, social media gives you a chance to communicate directly with customers and build your bar’s brand. Finally in your bar business plan comes the section on your financials. This will define how you plan to succeed as a healthy, growing business. For a new bar, this section will include your bar startup costs and a break-even analysis. You’ve probably considered your funding opportunities already by this point. In the financial plan section, you should lay out your plan for these in detail. Are your self-funding or raising investment? Are you planning to take out a small business loan and for how long? The financial plan should also look at how much revenue it will take you to break even. Create a financial analysis that discusses your profit and loss account, the cash flow you need and how you’ll manage a balance sheet. Solid financial planning and management will be one of the biggest influencers in your bar’s success. If you’re inexperienced or don’t have the time to do all the analyses above, don’t be afraid of reaching out to a financial and/or legal professional to give you a helping hand. If there’s one thing Australians never tire of, it’s discovering new drinking establishments and returning back to their favourites. For an entrepreneur planning to open a new bar, the opportunities to become a thriving business are pretty much endless. At the same time, success doesn’t come without planning. A bar business plan will not only form the roadmap of your business’s first few years, it can serve as a tool to help you adapt and grow way into the future.